The Eureka FloorRover Versatile Bagless Upright Vacuum is Eureka’s most powerful vacuum ever. A multi-surface vacuum cleaner, Eureka FloorRover delivers a powerful and effective clean with a variety of exclusive technologies. Using a multi-stage cyclone system, the Eureka FloorRover separates small and large size particles for continuous powerful suction. It uses a HEPA filter to capture 99.97% of dust and allergens. 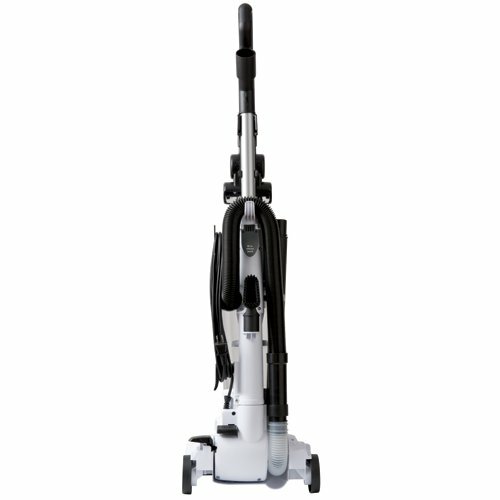 With new easy-glide wheels and swivel steering, this upright vacuum is very easy to maneuver. On-board tools include a 2-in-1 Upholstery Tool, a Pet Turbo Brush and a 16″ Crevice Tool for hard-to-reach areas. Eureka upright vacuum offers maximum flexibility for cleaning wood floors, tile surfaces, low to high carpet, upholstery, deep pile rugs, stairs or vehicle interiors. With an extra-long 30-foot cord you can clean the entire house without unplugging. Includes a 5-year limited warranty!